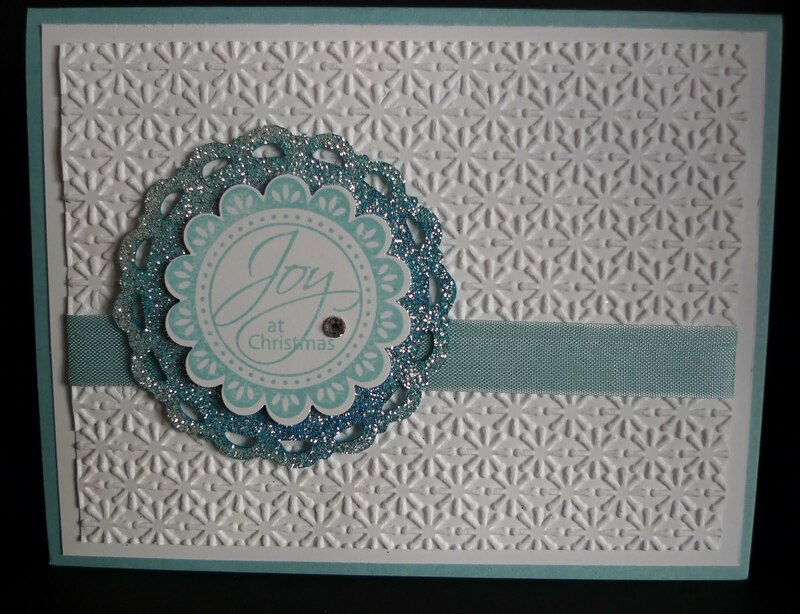 Karina's Kreations: Glimmer Paper Card! There is something to be said about a simple card with lots of Glitter. I don't know about you but shiny, sparkly things make me happy. I made this cute card for my downline to make at our coffee talk meeting and had to share it with my Monday stamping group as well. The card stock colors are Whisper White and Baja Breeze. I used Baja Breeze ink and Baja Breeze 1/2" Seam Binding Ribbon. The stamp set is called Perfect Punches #117022 (W) $30.95 or #120516 (C) $21.95. The Textured Impressions Embossing Folder is called Snow Burst #124096 $9.75. I used the Perfect Pennants Bigz L Die to cut out the Silver Glimmer Paper #124005 $5.95. 1. Drop a few drops of Tempting Turquoise Re-inker into a plastic container. 2. Fill an Aqua Painter with water and squeeze the aqua painter to get the bristles wet. Dip into the Tempting Turquoise re-inker and paint the glimmer paper with ink. Be generous with the ink. 3. Set the ink with a Heat Tool. The Glimmer Paper will dry to a light blue color. Do you love it? I'll have to try green or red next. Just remember to use a dark color of ink.